At Warshauer Law Group, we prioritize our clients. We are not a mass market, high-volume firm. Rather, we purposefully limit our caseload so we can really dig deep into our clients’ cases and represent their needs and injuries accurately, powerfully, and convincingly. In addition, our Atlanta accident lawyers collaborate with experts in various fields to strengthen our clients’ cases. We even employ an in-house doctor! Our entire team invests their time, energy, and resources into each and every case, providing our clients with a well-rounded case that effectively represents their needs. We believe that simply scratching the surface of our clients’ cases will not get them the results they deserve. By going the extra mile in every step of case proceedings, our firm fights for compensation that fully secures our clients’ present and future. As skilled Atlanta personal injury lawyers, we are not afraid to take cases to court if the settlement offered is less than what our client deserves. The Warshauer Law Group is excited to announce their 2018 Social Biases in the Courtroom Scholarship. Lyle Warshauer has personally recognized the double standard in the legal industry regarding gender inequality. As such, if you’re interested in reducing the gender gap and diminishing courtroom bias, visit our scholarship page to learn how you can earn $1000 towards your education. 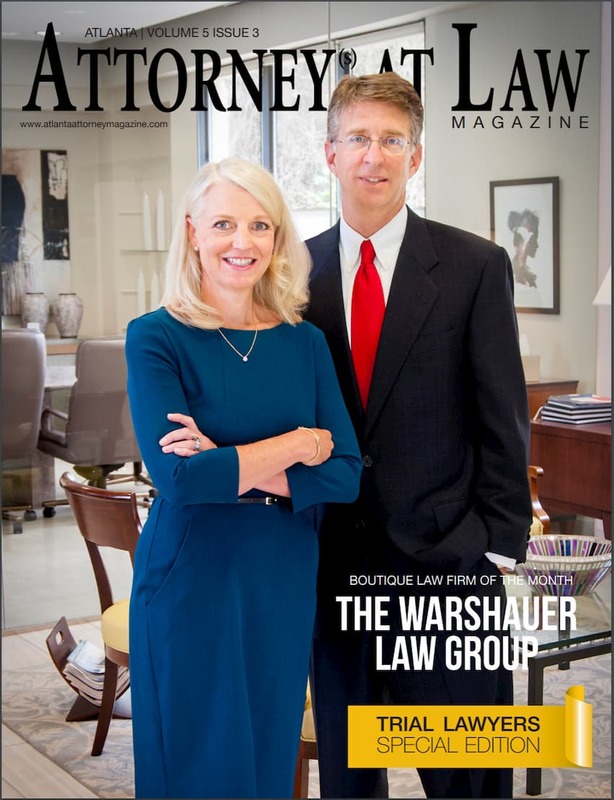 We are proud to announce the Warshauer Law Group was announced “Boutique Law Firm of the Month” by the Attorney at Law Magazine! We are proud members of the American Association for Justice, actively working to fulfill the association’s mission for a fair and effective justice system. We’ve been awarded the highest rating accomplishment by Martindale-Hubbell, one of the leading peer review rating systems in the nation. Nationally certified attorneys such as ourselves demonstrate the highest level of legal and professional accomplishment in their respective fields. Selection for inclusion in the prestigious list of Super Lawyers involves a comprehensive process that includes nomination, research, and peer evaluation. We are proud members of the American Association for Justice Leaders Forum Patron, dedicated to promoting safety, corporate accountability, advocating for a balanced civil justice system, improving our communities and educating lawyers to provide excellent advocacy for their clients. Attorney Lyle Griffin Warshauer recognized for proudly serving his community for 25 years. Michael J. Warshauer was awarded for his continuous professional recognition, an accomplishment realized by the top American Professionals. Michael J. Warshauer has been recognized by Atlanta Magazine as one of the Top 100 Attorneys in Georgia. We are proud members of the American Board of Trial Advocates, dedicated to the preservation and promotion of the civil jury trial right provided by the Seventh Amendment of the U.S. Constitution and educating the American public about the history and value of the right to trial by jury. Michael J. Warshauer has been recognized as a 2018 Top Ranked Lawyer by Martindale Hubbell. The attorneys of Warshauer law have been recognized by Super Lawyers. We had the pleasure of working with several members of the Warshauer Group. Lyle, Michael Warshauer, Jen, and Michael Perez. We were referred by a different attorney who didn’t handle these kind of cases. We contacted this group with very heavy hearts as this case involved the death of our beloved son. From the initial contact through the completion of our case, these attorneys were professional, dedicated, caring and displayed such empathy to us. They took time to explain each phase of the case, kept us up to date and informed on every aspect of it. If you need a law firm with dedicated professionals who make their clients top priority, Warshauer Law Group are the attorneys to contact. In-House Doctor – Our in-house physician provides medical insight into the injury cases we handle, giving our cases an edge in court. Personalized Representation – We are exhaustive in our research and counsel, because we know that scratching the surface won’t get our clients the results they need. State-of-the-Art Facilities – We use our state-of-the-art facilities to recreate your accident scene and build a strong, compelling case in court. 24/7 Availability – We take calls after hours, which means we’re always available to help. Seeking medical attention from a healthcare professional such as a doctor, physical therapist, or chiropractor should afford you peace of mind that your well-being is in skilled hands. Furthermore, receiving care at a hospital or other licensed medical facility should inspire confidence that the doctors you receive treatment from—as well as the facilities where you receive treatment—meet medical standards. Unfortunately, what should be true is not always the case, and the results can be as devastating as they are unexpected. If you suffer harm because of negligence and carelessness during medical care or treatment, an Atlanta medical malpractice lawyer could help you seek compensation for your physical, mental, and emotional pain. To have the best chance at getting what you deserve, you should have a good understanding of what options you can pursue, how best to devise a plan of action, and what steps to take moving forward. Let a dedicated medical malpractice injury attorney in Atlanta guide you step-by-step as you fight to recover what you have lost. Our Atlanta injury attorneys are ready to fight for you. Tell us about your case by filling out the free, no-obligation contact form below. If you believe you are the victim of medical malpractice, it may be critical for you to take the necessary steps to protect your rights. Contact an Atlanta medical malpractice lawyer as soon as possible to discuss your concerns. Our legal team could help you understand the state’s laws and the damages you should seek for the losses and injuries you experienced through no fault of your own. A lawsuit like this is usually complicated, so you likely need an experienced and knowledgeable medical malpractice attorney to advise you on the best possible strategy for your situation. Schedule an appointment today and learn what you could do to pursue the justice you deserve. At Warshauer Law Group we’re passionate about the youth in our community. For that reason, we are proud to have sponsored the Rotary Club of Vinings 2018 Vinings Down Hill 5K Run for the Kids. This event enabled worthwhile charities to receive the funds they need to continue and build. To learn more about this event and see photos please visit our Vinings Down Hill 5K Run page.